Wildlife Tour of India is a fascinating India travel itinerary. Though the title suggests that Wildlife Tour of India primarily caters to the aspirations and expectations of a wildlife adventurist, but inclusion of Delhi, Jaipur and Agra (Golden Triangle) makes it all the more attractive by showcasing cultural and architectural gems of India. Wildlife Tour of India covers three famous national parks - Ranthambhore National Park, Bandhavgarh National Park and Kanha National Park . Since these three national parks, the best tiger reserves of India, are being mapped in this tour, the Wildlife Tour of India can be easily termed as tiger trailing expedition. Ranthambhore is famous for tiger spotting even in daytime. 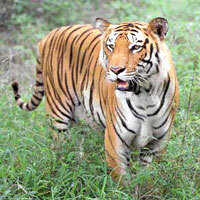 Bandhavgarh Tiger Reserve prides on having highest tiger density. Kanha National Park boasts of one the oldest and most-appreciated tiger reserves. 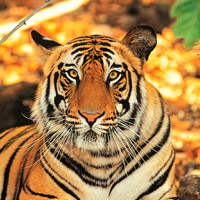 Wildlife Tour of India is most coveted tiger trail tour. On arrival at New Delhi international airport, representative of Optima India Tourism will welcome you with traditional warmth of hospitality. You will be taken to pre-booked hotel of Delhi and ensured smooth check in. At this time, you will be presented with copies of your hotel vouchers, flight tickets, train tickets, invoice and itinerary. After a long and fatigue-some journey to India, relax and have overnight stay in New Delhi hotel. Wildlife Tour of India is special in a sense that it not only takes you to famous tiger reserves of India but also offers an opportunity to visit and explore famous cultural destinations of north and central India. Delhi is among a famous tourist destination of India with lot of ancient and medieval heritage, reflecting in grand monuments of yore. First half of the sightseeing tour, along with Delhi tour guide, will encompass Red Fort, Jama Masjid, Chandni Chowk. One of the exotic India experiences will be a rickshaw ride in Kinari Bazaar of old Delhi. Hereinafter, move to visit Akshardham temple, a marvelous piece of Hindu temple architecture. After visiting Akshardham Temple, proceed to visit Parliament House, President Palace, Secretariat, India Gate, Raj Path, Qutub Minar and Lotus Temple. Delhi is famous for delicious dishes and can be relished during lunch in a nice restaurant of New Delhi. Later in the evening, return to New Delhi hotel for overnight sta. Have breakfast a bit early in the morning in New Delhi hotel, check out around 8 am and depart for Jaipur, the Pink City of Rajasthan. Jaipur, the capital of Rajasthan, allures guests for its cultural richness and beautiful historical monuments. On arrival at Jaipur, you will received by the representative of Optima India Tourism and smooth check in will be ensured. Jaipur tour guide will also be introduced with you in the very lobby of the hotel. Having lunch, either in hotel or in any city restaurant, proceed for leisurely sightseeing of Jaipur which includes Albert Hall museum and Birla Temple. You will be attending spectacular evening worship ceremony in the temple. Return to Jaipur hotel for overnight stay. Day 4 Jaipur sightseeing tour. The full day sightseeing tour of Jaipur will start right after your early morning breakfast. Jaipur tour guide will accompany you and take you to first on the excursion of Amber Fort & Palace. Though Amber Fort is famous for its gargantuan size, sturdy structure, Rajput architecture and beautiful carvings and paintings but an elephant ride from the foothills to the main gate at the hilltop attracts a tourist in large number. After visiting Amber Fort, you will be driven to Jaigarh Fort, still in possession of the royalty. Jaigarh Fort is known for Jaivan (largest canon of the world), arms foundry, in-house museum and a great water harvesting, storage and distribution system. Having seen Amber Fort and Jaigarh Fort, move to Jaipur city. Have lunch in a nice restaurant and again proceed to visit prime attractions of Jaipur, namely, City Palace, Jantar Mantar and Hawa Mahal. These three iconic monuments of Jaipur form a cluster and are situated amidst the market. After visiting City Palace, Jantar Mantar and Hawa Mahal, you will be left with enough time to explore bustling market, famous for jewellery and ethnic products. Take your own time to examine products and their rates in up-market showrooms to roadside shops. Later in the evening, you will be taken to Govind Dev Ji temple to attend magnanimous ‘aarti’- a special experience of cultural India. Return to Jaipur hotel for overnight stay. Day 5 Jaipur – Ranthambhore National Park (by car-160 kms/ 04 hrs). Have delicious breakfast in Jaipur hotel and move for Ranthambhore National Park which is strangely a natural abode of Royal Bengal tigers. Ranthambhore Tiger Reserve is a hot tourist destination of India & Rajasthan to watch the big cat in its natural ambience. On arrival at Ranthambhore National Park, you will be taken to the jungle resort. You will be greeted with Welcome drink. Check in at the resort. During your stay in Ranthambhore, you will be provided breakfast, lunch, high tea and dinner. In the evening, enjoy bon-fire and folk music by the local artists. Spend the evening in leisure and have overnight stay in Ranthambhore resort. Day 6 Ranthambhore Tiger Reserve- game drives. The 6th day of Wildlife Tour of India will be an exceptional day in terms of coming in close contact with Indian flora and fauna. In addition to the Royal Bengal tigers, other large predators found in Ranthambhore include Sloth Bear, Striped Hyena, Wolf, Wild dog, Jackal, Indian Fox, Palm Civet, Small Indian Civet, Common Indian Mongoose, Small Indian Mongoose, Ratel, Marsh Crocodile and the Indian Python. Two game drives (jeep safaris) will take place- one in the morning and another in the afternoon. Each of these game drives will be of 4 hrs. Later in the evening, return to Ranthambhore resort for overnight stay. While moving for Agra after having sumptuous breakfast in Ranthambhore resort, you will be taken to deserted city of Fatehpur Sikri. Fatehpur Sikri, famous for its architectural amalgamation of Hindu & Islamic architectural styles, is home to many monuments built by Mughal king Akbar. Akbar had shifted his capital from Agra to Fatehpur Sikri and, in this quest, built various architectural marvels like Jama Masjid, Buland Darwaja, Panch Mahal, Jodha Bai Palace and Birbal Bhawan. Also, you will find shrine of Salim Chishti here. It is believed that visiting Salim Chishti's shrine fulfills one's wishes. French President Nocholas Sarkozy's wife Carla Bruno had also visited Fatehpur Sikri. But Akbar had to relocate his capital in Agra due to paucity of water in Fatehpur Sikri. After visiting Fatehpur Sikri on Wildlife Tour of India, you will be proceeding towards Agra. On arrival at Agra, you will check in at Agra hotel. Spend the evening in leisure and have overnight stay in Agra. Day 8 Agra sightseeing tour – Umaria (by train). You will be imparted another exotic India experience of having ‘tonga-ride’ in Agra. You will be taken to Taj Mahal in the morning on ‘tonga’ itself. Thousands of tourists visit India to have a glimpse of Taj Mahal, an epitome of love built out of white marbles of Makrana. Taj Mahal, a UNESCO World Heritage Site, was built by Mughal king Shah Jahan in the memory of his beloved wife Arjumand Bano, famously known as Mumtaj Mahal. Built on the banks of river Yamuna, Taj Mahal looks most beautiful in the dawn hours. Wildlife Tour of India provides you opportunity to behold the mesmerizing beauty of Taj Mahal in the early morning hours. Early in the morning, you will be taken to Taj Mahal. Spend your morning hours with Taj Mahal. Thereafter, return to Agra hotel for getting relaxed, refreshed and to have delicious breakfast. After breakfast, check out from Agra hotel and move for visiting Agra Fort, Tomb of It-Mad-ud-Daula (Baby Taj) and Sikandara (Tomb of Akbar). Late afternoon, you will be driven to Agra Railway station to board train for Umaria, the nearest railhead to Bandhavagarh. Overnight journey will be in the train. Late in the morning, the train will reach at Umaria which is the nearest (about 40 kms) railhead to Bandhavgarh National Park. De-board the train at Umaria. You will be received by our representative Umaria railway station and taken to Bandhavgarh National Park. On arrival at Bandhavgarh, check in at the jungle resort. You will be welcomed traditionally. Spend day at leisure. Overnight stay is scheduled in Bandhavgarh resort. Day 10 Bandhavgarh National Park game drives. 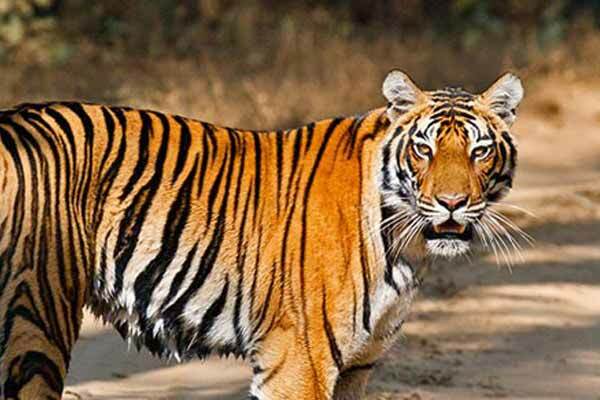 Bandhavgarh is natural ambience of Royal Bengal tigers and has fairly large number of tigers compared to many other Tiger Reserves in India. Owing to higher density of tiger population, wildlife enthusiasts happen to see tigers more easily and frequently. Among various highlights, jungle safari on elephants will be an altogether exotic experience of India. Wildlife Tour of India will take you on a morning safari viewing the main attractions in Bandhavgarh like the dynamic wildlife, the rich forests, varied flora & fauna, rich bird life and an untouched natural habitat for an array of wildlife peculiar to the area. The possibility of spotting Sloth Bear, Wild Boar, Leopard, Tiger, Chital (Spotted Deer), Sambhar, Barking Deer, Nilgai (Blue Bull) and Chowsingha (Four Horned Antelope) is comparatively high. Two jungle safaris on elephant/jeep is carried out in a day. The first jungle safari takes place in the early morning hours. After having morning jungle safari, you will return to the Bandhavgarh resort to have meal and rest. Thereafter, another jungle safari takes place in the latter half of the day. Along with jungle activities, you will be taken to visit the Bandhavgarh Fort, believed to be 2000 years old and stands at the highest point. Overnight stay has been planned in Bandhavgarh resort. Day 11 Bandhavgarh National Park - Kanha National Park (270 kms/ 07 hrs). From Bandhavgarh National Park, after having sumptuous breakfast, you will be driven to Kanha National Park which finds ample mention in Rudyard Kipling's famous 'Jungle Book'. 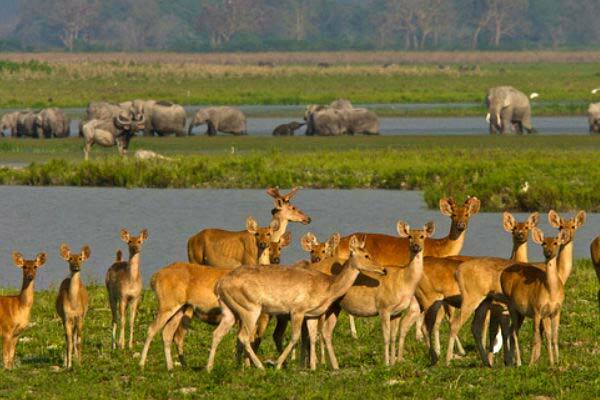 One of the largest Wildlife Sanctuary of India, Kanha National Park is deserves special mention with regard to successful conservation of Barasingha. Kanha National Park, a natural forest, is home to a variety of animals including tiger, panther, deer, wild pig, bison, monkeys and other animals besides some 200 species of birds. On arrival at Kanha National Park, check in at the designated hotel. Explore the natural beauty and wild set up on your own and relax. Overnight stay has been planned in Kanha National Park resort. Day 12 Kanha National Park game drives. Wildlife Tour of India now enters into its last leg but in one of the most sought after forest of India. Every day two game drives- morning and afternoon- are organized by the forest department in open jeeps, accompanied by a trained naturalist. A very interesting aspect of the jungle safari is that once the tiger is spotted anywhere in the jungle, through radio contact with the drivers, visitors are driven to the location and then by elephant back to the actual site where the tiger is spotted. After enjoying both game drives, have night stay in Kanha National Park resort. After having delicious breakfast, you will be taken to Nagpur (Maharashtra) or Jabalpur (Madhya Pradesh) to board flight for Mumbai/ New Delhi, depending upon your preference and departure plan. This also marks the end of the Wildlife Tour of India. Later, guests will depart for the airport for respective flights back home. Usually the first visit to Delhi stuns a visitor and it takes a while to be accustomed to navigate in the middle of a maelstrom of traffic of people, vehicles and even animals. Delhi, being a large cosmopolitan & segregated into two parts from tourism perspective, is composed of seven cities. The recent Delhi is city of New Delhi, present & colonial day political capital of India, was laid down by the British in 1914. New Delhi, a city of straight streets with most of modern hotels and large chunk of tourist inflow, is treasure of monuments of colonial regime like President House, Parliament, India Gate etc. Old Delhi is about two kilometers north of New Delhi. As its name suggests, Old Delhi is linked to the Indian tradition, predominantly Muslim traditions and culture, with a majority Muslim population. Old Delhi, a medieval city, was established by Shah Jahan as capital of Mughal Empire. Among famous monuments of old Delhi are Red Fort (the largest stone-built fort of India on the banks of River Yamuna), Jama Masjid (the largest mosque in India) and Chandni Chowk, the market of the old town, full of color and scent. South to New Delhi, there are five other ancient cities, Indraprastha, Dhillika, Siri, Tughlaqabad and Dinpanah which are the rest five Delhis. Historical evidences of thousands of years old existence of settlements in Delhi are continuously being unearthed at Purana Qila site with archaeological ruins and crumbling murals. Qutub Minar, ancient Iron Pillar, Lotus Temple and Akshardham Temple are some prime tourist attractions of Delhi. One of the great attractions of Delhi is endless and bustling market stuffed with all variety of goods and products prepared in various parts of India as well as the world. In the markets of Delhi, one can find objects coming from anywhere in India. Bargaining is suggested to get the best deal. Delhi is the best place in India to learn about the culture and history of the country, with its museums of history and Indian politics, as well as its extensive cultural program. Jaipur is the main tourist destination in Rajasthan and is known as the Pink City due to colorful facades of the streets. The Pink City was founded in 18th century, following the tenets of ‘vaastushastra’. The design of the city responded to the architectural guidelines of the Vedic texts and construction did not take more than a decade. An era of industrial development is happening and the city population has reached two million. In Indian city of Jaipur, expect exuberant palaces, gargantuan forts and interesting bazaars, rich in ancient jewellery, textiles and precious stones. During trip of Jaipur in March, observe the festival of elephants, renowned for its Rajput aesthetics. The city airport is called the Sanganer Airport, 15 kms south of downtown Jaipur. Among the prominent tourist attractions of Jaipur are Amber Fort, Jaigarh Fort, Nahargarh Fort, City Palace, Jantar Mantar, Hawa Mahal, Galta Ji Temple, Govind Dev Ji Temple, Albert Hall Museum, Birla Temple and lively and colorful market. Hawa Mahal, visited during 9 am to 4 pm and translated as Palace of Winds, offers best view at sunrise. The windows in Hawa Mahal were intended to allow woman courtesans observing public processions remaining unseen to the public. City Palace, with similar visiting hours that of Hawa Mahal, is surrounded by high walls and still partially inhabited by the Royalty. Major part of City Palace is converted into a museum, having large collection of clothes, arms, objects of the court and palace and various artefacts. City Palace is also an architectural gem. The Jantar Mantar is visiting at the same time and is a stone built astronomical observatory that was built by Sawai Raja Jai Singh. Scientific bent of the mind of the then Jaipur ruler is evident from Jantar Mantar. Sawai Raja Jai Singh, in his fascination with stars and planets, invented various devices like Samrat Yantra for observing the sky. About three kilometers from city is situated Galta Ji Temple, surrounding a sacred lake where devotees take holy dip before paying a visit to the deity. Galta Ji temple of Jaipur is famous as ‘Monkey Temple’ among the foreign tourists due to large number monkeys in the temple compound. Amber Fort, Jaigarh Fort and Nahargarh Fort are must see destinations in Jaipur. These fort palace complexes are major tourist attractions. Amber Fort for its architecture and size, Jaigarh Fort for world’s largest canon, arms factory and water harvesting system and Nahargarh Fort for its strategic location and panoramic view of Jaipur city are known. Amidst Ram Niwas garden is located Albert Hall, a museum which is a centre of attraction due to real mummy of Egypt housed here. At the outskirts of Jaipur and at the foothills of Mata Dungri is located Birla Temple, constructed of white marble and a modern monument. Govid Dev Ji Temple is housed within City Palace compound. Spread in sprawling 392 sq kms and surrounded by the Vindhyas and the Aravalis, Ranthambhore National Park in Rajasthan was declared a wildlife sanctuary in 1957 and a national park in 1971. In 1974, Ranthambhore National Park was brought under Project Tiger. Ranthambhore has glorious history and the national park has several historical monuments like Ranthambhore Fort and Raj Bagh ruins. It has several manmade lakes like Padam Talao, Raj Bagh Talao and Malik Talao which help keep the flora and fauna alive and flourish. The Tiger which is considered as the lord of the kingdom dominates the Ranthambore National Park. There are many wild animals belonging to the cat family like Leopard, Caracal, Leopard cat, Fishing cat and Jungle cat. The other large predators include Sloth Bear, Striped Hyena, Jackal, Desert fox, Palm civet, common mongoose, crocodile, python etc. There are two species of antlers the spotted deer (chital), and Sambhar deer and two kinds of antelopes namely the Indian Gazelle (chinkara ) and the Bluebull ( Nilgai ). Earlier, Ranthambhore used to be hunting ground of the royalty of Jaipur. Agra, the populated region of Uttar Pradesh (UP) and city of over a million inhabitants, is situated on the banks of River Yamuna. Agra was capital of Lodi dynasty and later remained capital city of the Mughal Empire till 1650, when the Mughal capital got shifted to Delhi. Hereinafter Agra was attacked, plundered and ruined by successive wars. What remains today of Agra is a neglected city but with spectacular monuments, heritage of a past imperial city. Agra is a treasure trove of gargantuan and beautiful monuments of Mughal era. 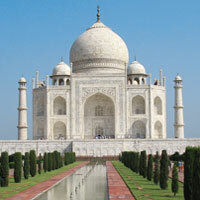 World renowned as one of the ‘Seven Wonders of the World’, Taj Mahal, is the prime attraction of Agra. Probably, Taj Mahal is the most visited single monument of India. The best view of Taj Mahal is offered at sunrise. With the change of the position of the sun, the shades and tones of colour of Taj Mahal change. Taj Mahal, a tomb or mausoleum, represents paradise and was built to bury the body Arjumand Bano Begum alias Mumtaj Mahal, favourite wife of Mughal Emperor Shah Jahan. The construction of the monumental building of Taj Mahal employed more than 20,000 men. Construction of Taj Mahal began in 1632 and lasted twenty years. Taj Mahal was studded with semi-precious jewels and stones, brought from China, Tibet, Afghanistan and many corners of the world. The marble used in constructing Taj Mahal was brought from Makrana, Rajasthan. The Taj Mahal is always associated with the love story of a king with his wife but more recent studies have revealed that the configuration of the building corresponds to Islamic ideas of the city of God. The Taj Mahal is closed on Fridays. Agra Fort, two kilometers from the Taj Mahal, is a military fort, built in 1573 in the form of a crescent. Some of its attractions are not open to visitors, such as Pearl Mosque (Moti Masjid). Agra Fort is a UNESCO World Heritage site. Tomb of Itimad-ud-Daulah is known as ‘Baby Taj’ and was built by Noor Jahan in fond memory of her father Ghias Beg, prime minister of Mughal Empire during the regime of Jahangir. Tomb of It-Mad-ud-Daulah, built of white marble, and Humayun’s Tomb were the inspirations behind the grandeur and architecture of Taj Mahal. Another attraction of Agra is the Mausoleum of Akbar at Sikandara built by Akbar in sandstone of a bright red color. Today, Agra is a famous tourist destination and part of the famous Golden Triangle along with Delhi and Jaipur, the main tourist circuit of north India. Bandhavgarh is situated in Shahdol district amongst outlying hills of the Vindhyan range. The tiger population at Bandhavgarh is the densest in India and offers perhaps the best chance in the world of seeing this elusive cat. Bandhavgarh is densely populated with other species: the great Gaur or Indian Bison can be seen with ease as they come on to the meadows to graze at dusk, sambar and barking deer are common sight, Nilgai are to be seen in the more open area of Bandhavgarh National Park . There are also many species of birds to be seen in the park. Spread over 437 sq kms of vast area, Bandhavgarh National Park, before declared as a National Park, was a game preserve of the king of Rewa. Still, jungle retreat of the king of Rewa, a small palace in the jungle, has now been converted into a luxury hotel, being managed by the Taj Group of Hotels. Earlier, Bandhavgarh was famous for being the sole habitat of white tigers . Kanha National Park lies in Madhya Pradesh of India. About 165 kms from Jabalpur, Kanha National Park is known for sal and bamboo forests, grasslands and streams. One of the best National Parks of India, Kanha spreads over 940 sq kms. Kanha Wildlife Sanctuary, a Project Tiger Reserve, harbouring an abundance of wildlife species, enjoys the reputation of a well-maintained and tourist-friendly National Park. There are over 200 species of birds, making Kanha a bird watcher’s paradise as well. Kanha is one place where you can be almost certain of spotting tiger in its natural habitat. Accommodation in the mentioned hotels on double sharing. Daily breakfast basis in Delhi, Jaipur and Agra. 02 jeep safaris in Ranthambhore National Park, Rajasthan. 02 jeep safaris in Bandhavgarh. 02 jeep safaris in Kanha. All meals (breakfast+ lunch+ high tea+ dinner) basis in Ranthambhore, Bandhavgarh & Kanha. Total Meals: 24 (Breakfast-12; Lunch-06; Dinner-06). Total night stays: 12 (Delhi-02; Jaipur-02; Ranthambhore-02; Agra-01; On Train-01; Bandhavgarh-02; Kanha-02). Maharaja-like elephant ride from foothills of Amber to the hilltop where the main entrance gate of Amber Fort is situated. Enjoy ‘tonga’ ride in Agra- from hotel to the gate of Taj Mahal. Well-appointed upgraded air-conditioned rooms at all places. Rickshaw ride in Chandni Chowk, Delhi. Morning boat cruise in the Ganges during morning hours to enjoy panoramic view of Varanasi ghats. English speaking & destination-specific guides at all destinations for mentioned sightseeing tour. Meet & assist at the airport on arrival & departure. Sightseeing tours as mentioned in the itinerary. Air-conditioned private car for the whole sightseeing tour. Driver for the whole tour. All prevailing taxes like luxury tax, service tax etc. All transfers, city tours, excursions & drives by air-conditioned transport. Interstate road tax, toll tax, parking charges, driver’s wages, fuel charges etc. Price is per person twin/ double sharing basis. Additional conditions may apply, please enquire for further details. Prices shown are fully inclusive of taxes. Additional levies, government charges & other applicable fees, including additional taxes and surcharges on flight routing, may apply and are beyond our control. Prices shown are for payments made by cash in store or through normal bank transfer into our accounts. Prices are subject to change without notice, due to matters outside our control, such as adverse currency fluctuations, fuel surcharges, taxes and airfare increases, please enquire for further details. Please provide your passport details to Intrepid at least one month before travelling. Please note that if you do not provide your passport details you may be denied entry to any National Parks that are visited along this itinerary, or you may be charged a fee by the local government as passport details are now a requirement for entry into all national parks in India. In India normally the check in time is 02:00 PM and check out time is 10:00 AM. Meals other than breakfast and as specified above. Video camera/ still camera fee applicable at various monuments. The same will be paid by you direct on spot on actual basis. Items of personal nature like telephone calls, laundry, tips, hard/soft drink etc. Any compulsory meal supplements during festive season is not included. Early check in & late check out at the hotels. Any other Items is not included in "Inclusions" heading. *Important Notice: The following information has been obtained from the relevant suppliers and should be considered an indicative guide only as to the prices that may be available for these products. Optima India Tourism cannot guarantee that any particular product will still be available at the following prices, or for your exact dates of travel. At time of making your booking, prices may differ to that price displayed on this website. Please contact an Optima India Tourism travel consultant to obtain the latest up to date information regarding applicable prices, fees and charges, availability and other terms and conditions which may apply. © 2013 ATH Technologies. All Rights Reserved.